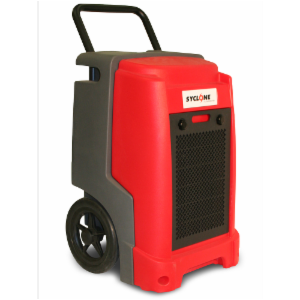 The Syclone™ Series 7 dehumidifier features a compact, portable design with easy to use digital controls. Durable rotational-molded housing and semi-pneumatic wheels provide a long service life and make it easy to transport to and from the job site. Automatic condensate pump removes water for unattended operation. Digital control will automatically restart if power is interrupted. Also features an hour-meter for timed operation. Exhaust port allows for easy connection to various ducting options.